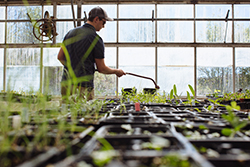 LAWRENCE – Last spring, 3,000 native seedlings were planted on the slope behind Blake and Twente halls as part of the Prairie Acre Restoration Project, an effort by University of Kansas departments to restore this historic prairie remnant. That restoration effort has continued this spring, in part to a grant from the Douglas County Community Foundation's Elizabeth Schultz Environmental Fund. The grant will allow Phase 2 of the project to begin, which includes expanding the site beyond its current boundaries and developing educational materials. KU student Beverly Umeh, a senior in ecology & evolutionary biology, was recently hired as the Prairie Acre restoration coordinator. 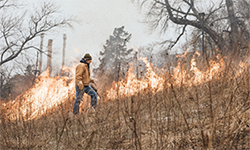 Her role has included arranging a prescribed burn at the Prairie Acre site to reduce invasive plants and allow the native plants to grow stronger and healthier, and working with students in the Environmental Studies Capstone class to care for seedlings that will be planted at the site April 20. The environmental studies class, led by Professor and Senior Scientist Kelly Kindscher, has been integral to the project. In addition to caring for plants in the greenhouse, students have been working at the site to remove non-native plants and will be involved in planting the new seedlings at the expansion site. KU students have been actively involved in planning for the future of the site through the capstone course, as well as through an urban planning course that is studying a larger area around the Prairie Acre. In addition to the expansion, the second phase includes developing a demonstration garden, which is being funded by a private donor. The garden will highlight key species in the prairie site and include interpretive signage. The Prairie Acre Restoration Project is a collaboration among the KU Center for Sustainability, Environmental Studies Program and Kansas Biological Survey. For more information and updates on the Prairie Acre Restoration Project, visit the Prairie Acre website. Photo: At top right, students and faculty from the Environmental Studies Program conduct a controlled burn of the Prairie Acre site in this March 2017 image. Bottom right, students in the Environmental Studies Capstone (EVRN 615) class water and monitor plants being grown in a greenhouse on West Campus. Photos from KU Marketing Communications.